17 Sebright Avenue, Worcester, WR5 2HH. Neil Jeffree is an Internationally successful tableware designer who has run his own product design consultancy since 2008. During this time he has designed product for many leading brands including Wedgwood, Royal Doulton, Maxwell & Williams, Mason & Cash and Typhoon. Prior to 2008 he was senior product designer for Royal Worcester designing many of their ranges, including the incredibly successful Jamie Oliver suite of cookware and tableware. In 2015 he started developing a new range of product with the intention of launching them under his new tableware brand 'Neil Jeffree Worcester'. The first set of product was launched exclusively online via his website shop in November 2015. This initial launch consisted of a series of design led bone china mugs and a compact earthenware breakfast set. New range additions and designs have been added in the months since this launch. With a growing range of products Neil is now seeking retail opportunities and stockists for his product. 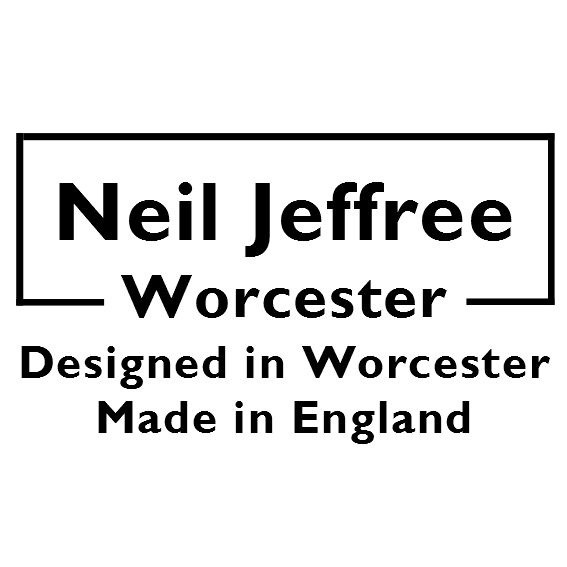 'Neil Jeffree Worcester' has been created with the intention of developing design led product inspired by modern life. From simple earthenware breakfast sets, Design No3, which create a calm and relaxing mood, to bone china mugs and cups which reflect the modern barista lifestyle, Design No1. With contemporary classic, Design No2, and quirky fun Design No4, this range of product has been created to showcase a diverse collection of designs and styles. With all pieces designed in Worcester and made in England, Neil Jeffree Worcester is founded on Neil’s passion to produce unique high quality pieces which combine function with contemporary style. “Neil Jeffree Worcester allows me the freedom to create a brand representative of my personal design style: modern classic shapes and simple lines and curves, within small ranges of different moods/looks which add points of interest and showcase the diversity of the brand. Every aspect of the product is considered, from the curve of the bowls to the placement of the handles, position of the brand stamps, the simplicity of the range names, and brand identity”. Neil adds that “quality is of essence to the brand and I develop all pieces myself from concept design through production modelling. It is very important to me to create product which has been developed and manufactured here in the UK, producing pieces which are high quality in design production and development, showcasing what is still possible with small UK manufacturers.'”. Design No 1: Contemporary White/Black & Gold. Simple curves influenced by modern living and the barista life style. Bone China. 250ml Mug, 250ml Latte Mug with Saucer, 200ml Cup with Saucer (in development), 90ml Demitasse Cup with Saucer. Design No 2: Contemporary Classic. Faceted design with a simple looped handle. A modern classic design style. Bone China. 325ml Mug. Design No 3: Contemporary Warm. Generous sizes and a warm friendly look create a relaxed set of breakfast product. Earthenware . 325ml Mug, 15.6cm Cereal Bowl, 20.6cm Plate. Design No4: Contemporary Fun. A fun design which will add some quirkiness to the stage. Bone China. 325ml Mug, (red, blue, green, yellow coloured handle additions currently in development).